In order to provide the best possible response to current and future requirements from customers of all TecAlliance product brands, the Consulting & Implementation Department has been restructured. With its new service portfolio TecAlliance can ensure excellent consulting and implementation of solutions for customers worldwide in accordance with the company strategy. For TecAlliance the Consulting & Implementation Department is at the interface between the Sales and Customer Support Departments. Its main activity is the processing and delivery of TecAlliance solutions and products and their technical implementation in customers’ existing IT systems. In order to respond to the different requirements of different markets and be as close to customers as possible, the department now has 25 employees from nine countries working at six locations. The department will now have a matrix organisation with three groups and be managed by Dr. Nadja Well, Vice President Consulting & Implementation. “The reorganisation of the department is an important step in order to further optimise the quality of customer projects regarding consulting and implementation. This way in the future we will also be able to meet the requirements of TecAlliance customers in the different markets and use our solutions and products to maintain the competitive strength of the international aftermarket,” is how Well explains the background of the reorganisation. The newly created group “Business Consulting 1” offers mainly content and functional consulting for users of the TecCom solutions and the data services of TecDoc and TecRMI. 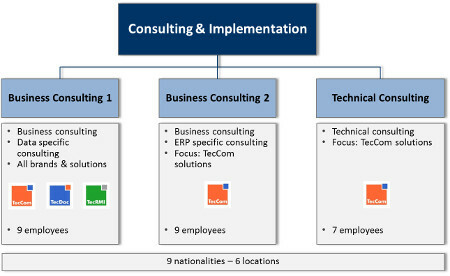 The group “Business Consulting 2” will concentrate on content, functional and technical consulting for TecCom customers, in particular the integration in existing ERP systems. The group “Technical Consulting” will focus its activities on technical consulting for all TecCom core solutions.